Are you a member of a club or association looking for something different? Estonia, and Villa Ottilia, might be just the right choice for a memorable experience. We can accommodate 14 people. Rent the whole house and you’ll have the three rooms and small lobby on the top floor, the large breakfast room in the middle floor, and the ground floor with the Finnish sauna all at your disposal. 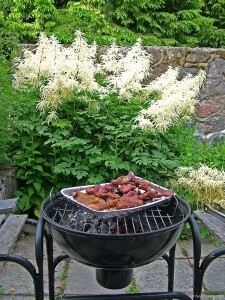 You can also use our backyard terrace, for example for a nice evening barbeque. Even a larger group won’t be a problem. There is a small hotel close to us, with which we have always been able to negotiate a good price if we can’t accommodate the whole group at Villa Ottilia. When your day programme ends, there’s a lot to do. In winter, skiing, snowtubing, snowboarding. In summer, lazing on the beach, jogging or hiking in the woods or challenging yourselves on the Adventure Park’s hair-raising courses. Depending on the composition of your group, it could also be a relaxing massage, beauty salon or hairdresser. 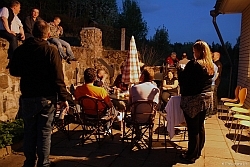 In the evening, a barbeque and a few drinks on our backyard terrace, and then relaxing in the soothing heat of our wood-fired sauna. Is there a better combination of work and leisure? The breakfast room easily doubles as a conference room, and if you book the whole house for yourselves, your confidential company information will stay where it needs to stay. Contact us for a special quote! Get in touch with us. Tell us about your needs and wishes, and we’ll tailor a package just for you. Including interesting places to visit, if you want.